…were a Swing Era band of the 30’s & 40’s who combined music with cornball humor on their popular weekly radio program. RKO signed them to a movie contract and gave them this silly but entertaining “old dark house” comedy, teaming Kay and the band (featuring Ginny Simms, Harry Babbitt, Sully Mason, and the immortal Ish Kabibble!) with horror greats Boris Karloff , Bela Lugosi , and Peter Lorre . It’s got all the prerequisites: secret passageways, a creepy séance, and of course that old stand-by, the dark and stormy night! The plot has Kyser’s band hired for Helen Parrish’s 21st birthday party at said spooky mansion, with band manager Dennis O’Keefe as her love interest. Bela gets the juiciest part as flamboyant phony medium Prince Saliano, Boris is a shady family friend, and Lorre his usual sinister self. Alma Kruger plays Helen’s aunt who’s into spiritualism, which sets things in motion, and bumbling Kay gets to solve the mystery. Nothing earth-shaking going on here, but fun for fans of the Terror Trio. Fun Fact: The film received an Oscar nomination for Best Song, “I’d Know You Anywhere”, written by Jimmy McHugh and Johnny Mercer, and sweetly sung onscreen by Ginny Simms, who had a brief film career of her own after leaving the band in 1941. 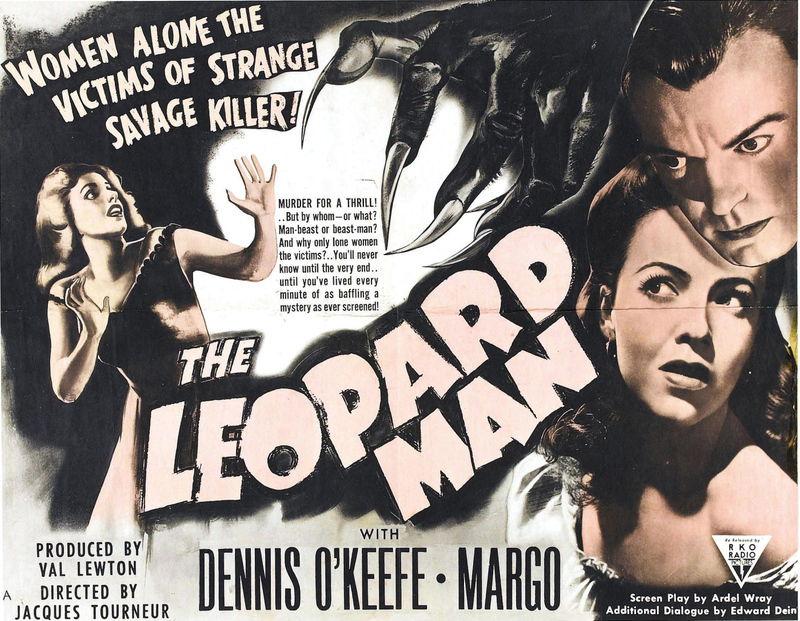 THE LEOPARD MAN (RKO 1943; D: Jacques Tourneur) – One of producer Val Lewton’s most unheralded films, chock full of his trademark use of sound and shadows. A black leopard gets loose from nightclub performer Jean Brooks’ act, and a series of gruesome murders follow in a small New Mexico town. This tense, gripping ‘B’ is loaded with eerie scenes; I especially liked the one in which a young girl gets locked in a cemetery and stalked by the killer cat (or is it a human – the movie will keep you guessing!). Dennis O’Keefe is Jean’s publicity agent whose stunt goes awry, Margo (later married to Eddie Albert) a castanet-clicking dancer/victim, and Isabel Jewell shines as a Gypsy card reader. Mark Robson’s marvelous editing job on this and Lewton’s CAT PEOPLE got him promoted to the director’s chair for THE SEVENTH VICTIM later that year. 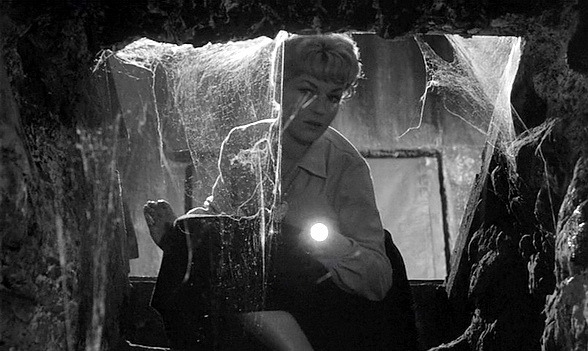 This chilling horror-noir doesn’t get the attention of other Lewton films, but deserves a much larger audience. Fun Fact: Based on the novel “Black Alibi” by prolific pulp author Cornell Woolrich, whose many books and short stories were made into film noir classics. Hot Damn! She’s the whole show in this minor chiller directed by Walter Grauman, who later helmed 1964’s LADY IN A CAGE and tons of TV (including 53 episodes of MURDER, SHE WROTE). Fun Fact: Weingraf gets off the best line when he tells Allison, “There are only two places where you belong. The jungle – and the place where I first found you!”. Burn!!! 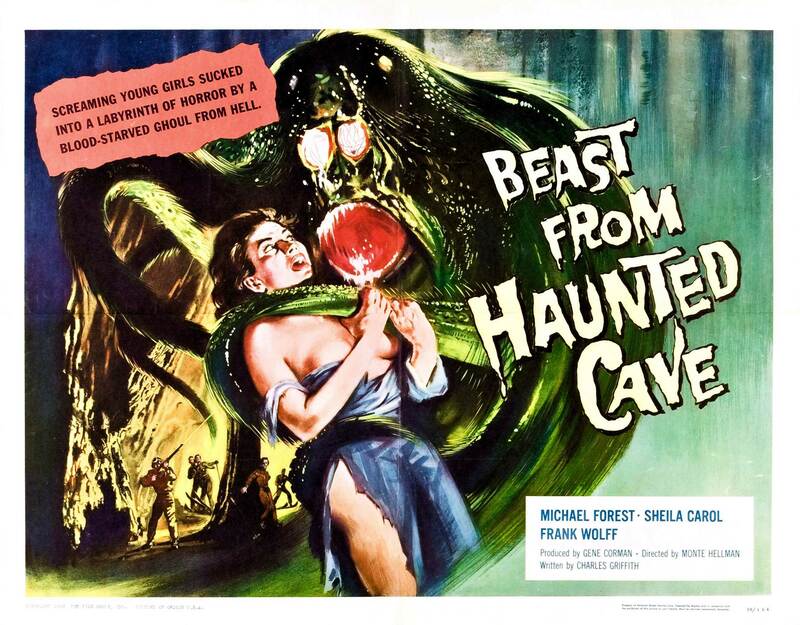 BEAST FROM HAUNTED CAVE (Filmgroup 1959; D: Monte Hellman) – An uneven blend of the horror and crime genres courtesy of the Corman Brothers finds crook Frank Wolff and his gang (including his perpetually soused moll Sheila Caroll) plotting a gold bar heist using an explosion at a mine as a diversion. 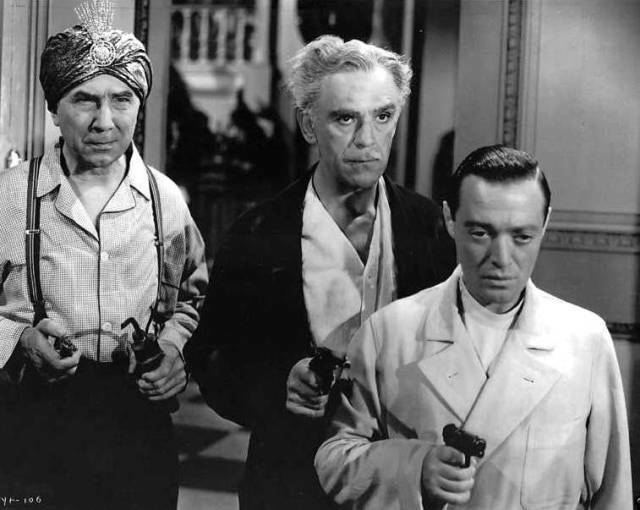 Wolff and his cohorts (perennial Corman actor Wally Campo and Frank Sinatra’s cousin Richard!) use good-looking ski lodge instructor Michael Forest to lead them on a cross-country ski trip to make their getaway, but the blast awakens a not-so hideous monster from its slumber that tracks them down! First film for director Hellman has its moments, but the rock-bottom budget defeats him. Filmed on location in the Black Hills of South Dakota. Fun Fact: The unscary monster was designed and played by actor Chris Robinson, the original “I’m not a doctor, but I play one on TV” commercial ad guy! 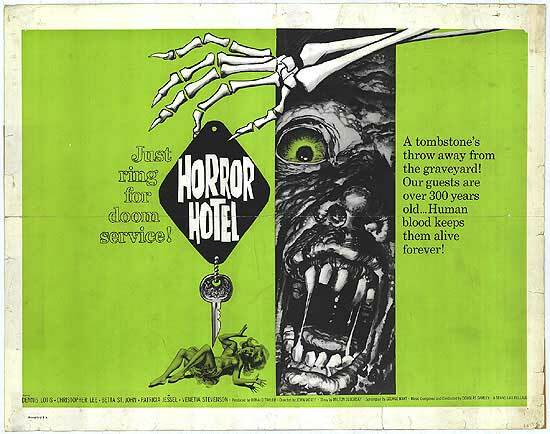 HORROR HOTEL (Vulcan/Trans-Lux 1960; D: John Llewellyn Moxey) – Also known as CITY OF THE DEAD. New England 1692: accused witch Elizabeth Selwyn curses the town of Whitewood, MA as she’s burned at the stake. Present Day: college student Nan Barlow wants to do her term paper on witchcraft and devil worship, and is directed by her history professor Alan Driscoll to travel to his hometown of Whitewood for research. He even recommends she stay at The Raven’s Inn, run by Mrs. Newless (who bears a striking resemblance to Elizabeth!). Nan immediately notices strange things about Whitewood: the fog-shrouded town doesn’t look like it’s changed in 200+ years, the townsfolk aren’t very friendly, the old reverend warns her “Leave Whitewood”, and weird noises emanate from the cellar. The only person who welcomes her is the reverend’s granddaughter Patricia, newly arrived herself and running an antique bookstore. Curiosity gets the best of her and… DON’T GO IN THAT BASEMENT, NAN!! When Nan doesn’t return home after two weeks, her brother Ronald and boyfriend Bill become worried. Patricia, too, is worried, and pays a call on both Ronald and Prof. Driscoll. The men decide separately to go to Whitewood and investigate, and that’s when the fun really begins! This is probably Moxey’s best feature film, though he does have some good TV Movies on his resume (THE NIGHT STALKER, HOME FOR THE HOLIDAYS, NIGHTMARE IN BADHAM COUNTY). 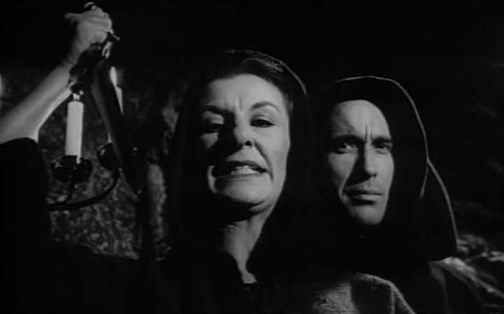 Christopher Lee is dark and ominous as Driscoll, but it’s Patricia Jessel (A FUNNY THING HAPPENED ON THE WAY TO THE FORUM ) who stands out in a truly bloodcurdling performance as Elizabeth Selwyn/Mrs. Newless. The rest of the cast (Betta St. John, Valentine Dyall, Venitia Stevenson, Dennis Lotis) is equally good, and the British actors do a fine job maintaining their American accents. This incredibly creepy nightmare of a movie is an old favorite of mine, and highly recommended! Fun Fact: This was a Vulcan Production from Max Rosenberg and Milton Subotsky, who soon changed their company’s name to Amicus , premiere makers of horror anthologies in the 60’s & 70’s. ‘Horror Hotel’ and ‘The Leopard Man’ are the best of the lot, Drew. 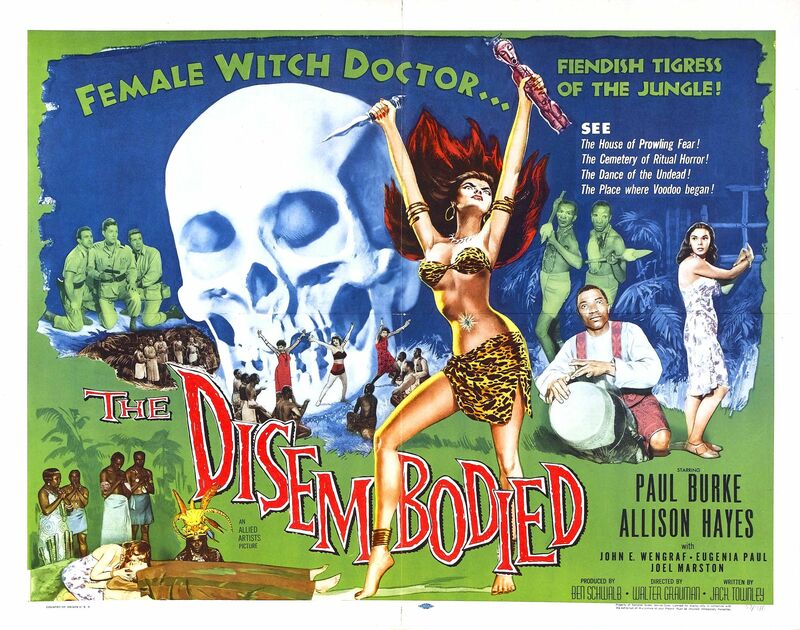 ‘You’ll Find Out’ is good for Boris, Bela, and Peter, and Allison Hayes makes ‘The Disembodied’ worthwhile. 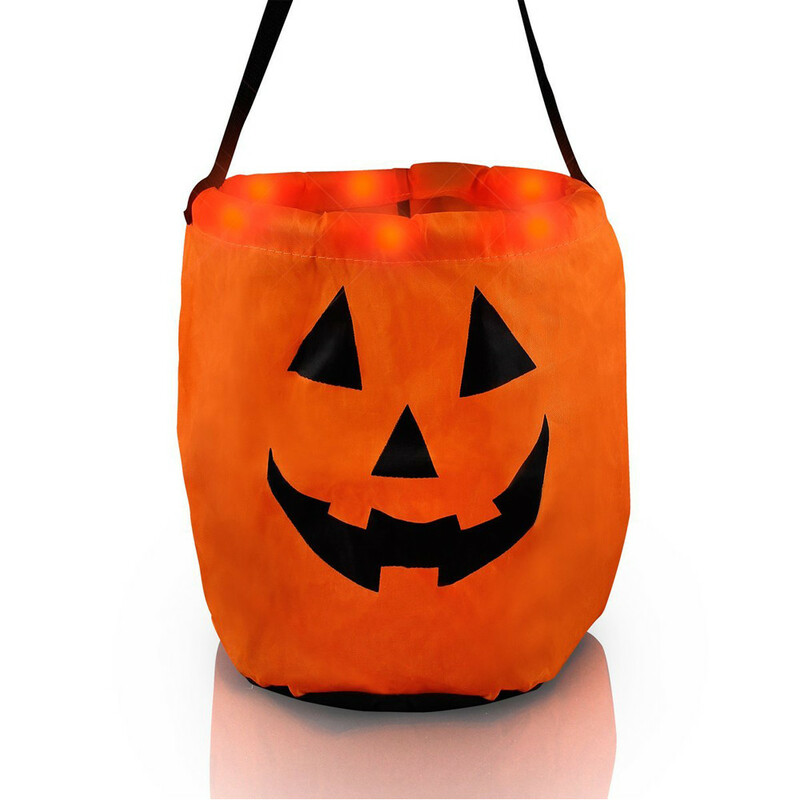 As for ‘Beast From Haunted Cave’… you can skip that turkey! !